As millions of people regroup from the impact of the earthquakes in Nepal, a team of international volunteers is combing through satellite imagery of the region to identify additional hazardsearthquake-induced landslides. "Landslides are a common secondary hazard that are often triggered by earthquakes or rainfall," said Dalia Kirschbaum, research scientist at NASA's Goddard Space Flight Center in Greenbelt, Maryland. "Because landslides can mobilize and move so quickly, they often cause more damage than people realize." As part of a disaster relief response to the 7.8-magnitude Nepal earthquake and its aftershocks, Kirschbaum and Jeff Kargel, glaciologist at University of Arizona, are leading a group of volunteer scientists identifying where and when the landslides are occurring in earthquake-affected areas. Together, the team has mapped nearly one thousand landslides from April 25, the date of the first earthquake, to May 20. The group came together as part of NASA's response to the humanitarian crisis caused by the Nepal earthquakes. It was part of a NASA Headquarters-led comprehensive response that included government, industry, academia and volunteers, with teams focused on disaster mapping, measurement and assessment, hazard impact and communications. Under this effort, several smaller teams formed with various concentrations. Some subgroups provide "damage proxy maps" that tell the type and extent of the existing damage and "vulnerability maps" that show potential risks. 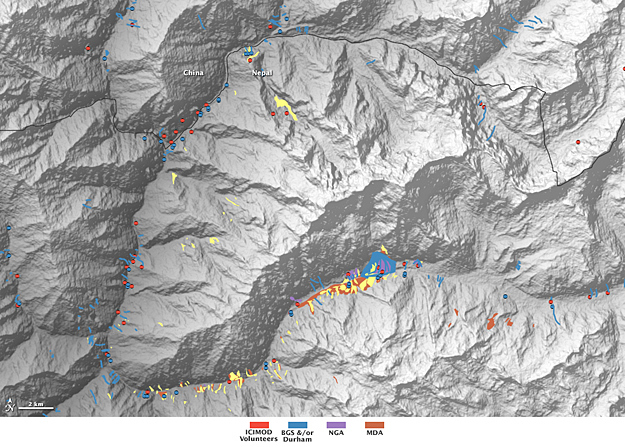 Kargel helped form this landslide-mapping subgroup the Induced Hazards team to identify hazards triggered by the earthquakes and guide relief efforts to Nepalese experts and authorities. He found volunteers by reaching out to his NASA-supported network called Global Land Ice Measurements from Space. Around 40 volunteers, from universities and government agencies in eight countries, came together to form the Induced Hazards team. The team uses satellite images to identify landslide locations, characterize additional hazards such as dammed lakes and incorporate other helpful information such as locations of nearby affected villages. Data sources include the Landsat satellites, Earth Observing-1 Mission (EO-1) satellite, Advanced Spaceborne Thermal Emission and Reflection Radiometer (ASTER) instrument aboard NASA's Terra satellite, WorldView and GeoEye satellites operated by Digital Globe, as well as image mosaics and topographic information accessible in Google Earth. The NASA-led volunteer effort has team members located in Nepal, the United States, Canada, the United Kingdom, China, Japan, Australia and the Netherlands. As part of this effort, researchers in Nagoya University in Japan have identified over 600 potential earthquake-induced landslides. Volunteers also come from, among other places, the University of Victoria in British Columbia, University of Dayton in Ohio, the Chinese Academy of Sciences, the International Center for Integrated Mountain Development (ICIMOD) in Nepal and the British Columbia government's Forests, Lands and Natural Resource Operations. A U.K. mapping team was established separately, consisting of scientists from the British Geological Survey and Durham University; they have similarly identified landslides using satellite data from various sources. 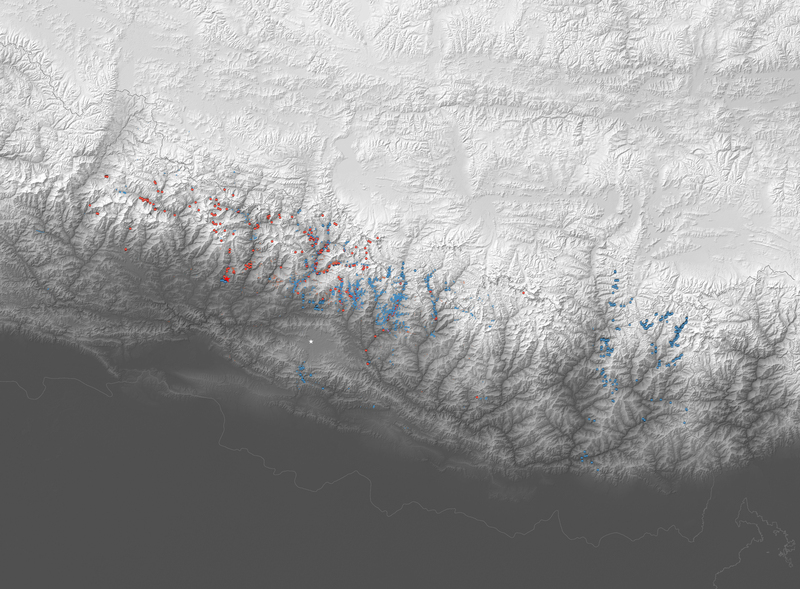 The NASA-led and U.K.-led teams are building their databases independently but are sharing their data to better aid the Nepalese and international earthquake response efforts. An independent Canadian-based group, MacDonald, Dettwiler and Associates Ltd. (MDA), locates landslides and potential landslides by analyzing areas before and after the earthquakes using information from RADARSAT-2, an Earth-observing satellite from the Canadian Space Agency. 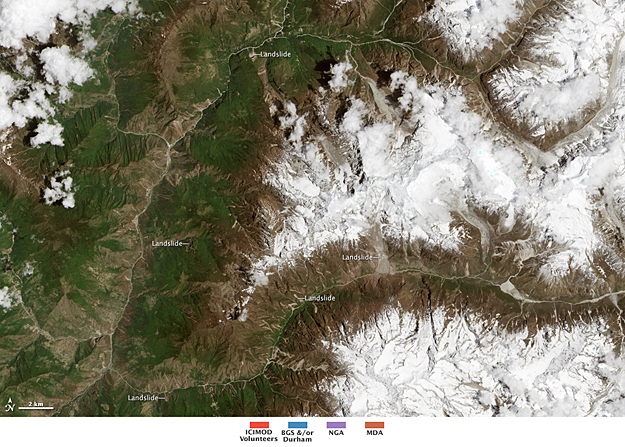 NASA and the volunteers share their findings with ICIMOD, an international center focused on improving the livelihoods of people in the Hindu Kush Himalayan region, including Nepal. ICIMOD also serves as a regional hub for SERVIR, a joint initiative led by NASA and the U.S. Agency for International Development. 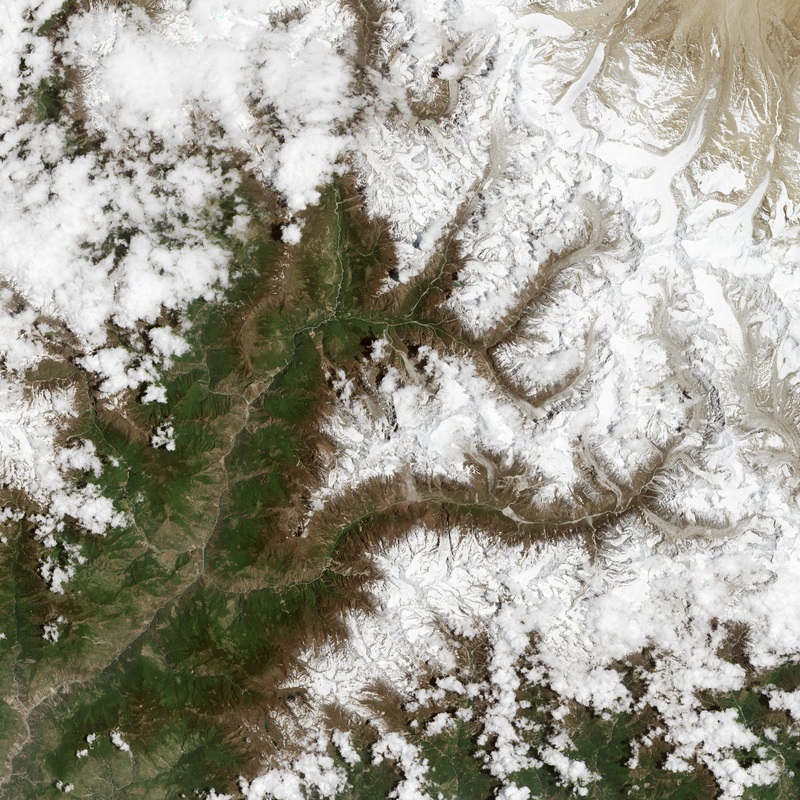 This NASA and ICIMOD collaboration provides information that Nepal government officials, their army, and scientific entities use to make informed decisions, such as evacuating or providing relief support to an area. Both Kirschbaum and Kargel are members of NASA's SERVIR Applied Sciences team. "There's been a lot of different people in the mix, which is both exciting and challenging, but I think it sets a new precedent for what's possible when you're dealing with such a huge humanitarian crisis," said Kirschbaum.